Have you ever wished you could go back in time and experience another time, another place? Now's your chance! Martha Conway's latest novel Sugarland, the winner of a Reader's Favorite Book Award, will whisk you away to Chicago to rub elbows with bootleggers, jazz musicians and more than one unsavory character! Follow in the steps of talented young pianist Eve Riser who is caught in a drive-by shooting that kills the bootlegger standing next to her, she forms an unlikely friendship with the bootlegger’s sister, Lena. Eve is looking for her missing stepsister, a popular night club singer who has been missing since the shoot-out, and Lena wants to find out who killed her brother. Together these two women navigate the back alleys and jazz clubs of the Roaring Twenties, encountering charismatic managers, handsome musicians, and a mysterious gangster called the Walnut who seems to be the key to it all. Sugarland is available as a print and e-book at Amazon, Barnes & Noble, and IndieBound. To win a copy of Sugarland, please enter using the Rafflecopter form at the bottom of this post. The giveaway contest closes next Monday, October 17 at 12:00 AM EST. We will announce the winner the same day in the Rafflecopter widget. Good luck! Martha Conway’s debut novel 12 Bliss Street (St. Martin’s Minotaur) was nominated for an Edgar Award while Thieving Forest won an Independent Publishers Book Award, the Laramie Award, a Reader’s Choice Award and the 2014 North American Book Award in Historical Fiction. Her short fiction has appeared in The Iowa Review, The Mississippi Review, The Quarterly, Folio, Puerto del Sol, Carolina Quarterly, and other publications. She graduated from Vassar College and received her master’s degree in Creative Writing from San Francisco State University. 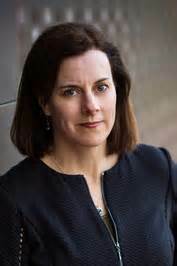 She has reviewed fiction for the San Francisco Chronicle, The San Francisco Review of Books, and The Iowa Review. The recipient of a California Arts Council fellowship in Creative Writing, she has taught at UC Berkeley Extension and Stanford University’s Online Writers’ Studio. WOW: In my opinion, Sugarland has a little something for everyone. There's murder, more than one mystery, romance, history. What readers do you think Sugarland will appeal to? MARTHA: So far it seems as though readers who love the Roaring Twenties and historical fiction in general have been the most ardent supporters of Sugarland. Although it is a mystery, there is no detective, and no “gather the suspects in one room to explain how the crime went down” kind of scene. I suppose it’s a sort of amateur sleuth mystery. But I think for those readers who like to immerse themselves in a specific time and place, the setting will encourage them to open the book, and the mystery will keep them turning the pages. WOW: Sometimes it seems easier to write a novel with a very specific audience in mind: a book for mystery lovers, a book for romance lovers, etc. But Sugarland transcends the traditional categories we place novels in. Does that make finding an audience easier or more difficult? MARTHA: I think it makes marketing more difficult, which may be just another way of saying finding an audience; however yes, I do think it is challenging. For better or for worse, I seem to do that with all my novels—take a little from this genre or that genre, depending on what I think will make the story more compelling. I like action, and I like dialogue, and I like setting, so I might borrow techniques from thrillers or historical novels or even contemporary novels, if I think they’re effective. To me, it’s all about keeping your readers interested in the story. WOW: Reading Sugarland, your characters just jumped off the page they were so...alive. But, living in the 1920s their lives are so different from modern characters. Is there a trick to accurately portraying characters from another time? Not just details like their clothes and homes but the way they look at life. How do you get that right? MARTHA: I spent a lot of time on research. A lot! I think I’ve been writing this novel, on and off, for over ten years (I’m afraid to count it up exactly!). I began writing it before I wrote Thieving Forest, and then I put it away for a long time, in part because I found certain aspects of it (like writing the technical side of the early jazz the characters play) very challenging. I love doing research about daily life, however. I’m looking at my own card catalogue now, and under the category “Sources” I list over forty books and articles and collections of interviews that I took notes on as I collected details to use. Interviews are especially useful in terms of understanding the way in which people understand their lives. WOW: Sugarland is your third novel. What do you know now about writing that you wish you had known while writing your first book, 12 Bliss Street? MARTHA: I wish I had known that one of the most important pieces of storytelling is figuring out what your character wants, and deciding early on if she is going to get it or not. To me, no matter what the genre is, and whether or not this character desire is forefront in the story, that is the basic scaffolding of any story. WOW: Your first novel, 12 Bliss Street, was published by Minotaur Books, a branch of MacMillan. But Thieving Forest and Sugarland are with Noontime Books. Are you your own publisher? Why did you decide to go this route with your last two books? What are the advantages/disadvantages of not being with one of the big traditional publishing houses? MARTHA: I am indeed my own publisher for Thieving Forest and Sugarland. I created the imprint Noontime Books, and had a kind of baptism of fire as I taught myself the ins and outs of book production. That was difficult, even though I have a background in publishing—over the years I’ve worked for various publishers doing various jobs including electronic typesetting, editing, copyediting, and proofreading. Marketing was a different story—I had very little experience with that. The advantage of not being with a traditional publishing house is that you can make your own book your own way. That’s also the disadvantage, though, because you have to learn how to do that! And it costs money, of course—your own money, unless you run a successful crowdfunding campaign, which I did not attempt to do. So it’s a lot of time and a lot of money. But if you believe in your work, it’s worth it. WOW: In addition to being a writer, you teach creative writing. As a teacher what is one mistake or bad habit that you see in writers that you'd like to warn us all about? MARTHA: The biggest mistake new and seasoned writers make on their first drafts, in my opinion, is trying to fit too much into the first chapter. The reader needs far less information than you might think. The main thing is to get them hooked and keep them hooked. It’s actually good for readers to have questions in their mind—it keeps them reading to find out the answers. WOW: At the time of our last interview, you were hard at work on The Floating Theatre. Would you like to tell us how Sugarland managed to skip ahead of The Floating Theatre? Do we still have The Floating Theatre to look forward or is it the WIP that just wasn't meant to be? MARTHA: As I mentioned a little earlier, Sugarland was a novel that I kept putting away and then coming back to. After about its third or fourth draft, I put the manuscript away “for good,” thinking I had done all I could do, and I began to write Thieving Forest. Then I had a kind of breakthrough or ah-ha moment for Sugarland when I was in the middle of writing Thieving Forest, which was to drop a certain storyline I’d had running that complicated the plot (and dragged down the action). In an earlier version, Lena, the bootlegger’s sister, had had a fiancée who kind of disappeared in the Great War—he didn’t die, but he also never returned. I still have a scene where she sees him that I can send to anyone who is interested—a kind of back-of-the-curtain backstory. But overall, the sub-plot didn’t work with the general story structure. Once I got rid of that sub-plot, the story came alive. The Floating Theatre is alive and well, though under a different title (to be determined!). It will be published by Simon and Schuster in the U.S. in 2017, and by Bonnier Zaffre in the U.K. So as you see I’m going with a traditional publisher for this one. If you or any of your readers want to get updates on that novel, email me (marthamconway@hotmail.com) and I’ll put you on my mailing list! Thanks so much for hosting me on The Muffin, and for your interest in Sugarland! Martha Conway is back with her new historical mystery Sugarland. Don't miss the launch of her new WOW blog tour with an interview and a giveaway. Stop by today to learn more about Martha Conway and her latest novel Sugarland. Martha Conway, author of the historical mystery Sugarland, shares why setting is a writer's best friend. Read today's review of Sugarland, a Jazz Age murder, by Martha Conway and you'll be adding another book to your TBR list. Stop by for a 5Ws interview with Martha Conway, author of the historical novel Sugarland. Want to escape into a world of music, adventure and love? Read today's review of Martha Conway's Sugarland--it could be just what you've been searching for! Learn more about the professional female performers of the 1920s, two of them are the driving forces behind Martha Conway's latest novel Sugarland. Win your copy of Sugarland today! 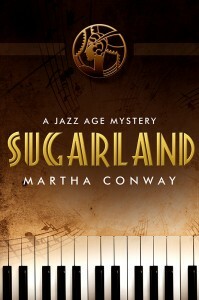 Today is your chance to win a copy of Sugarland, a jazz age mystery by Martha Conway. Want to escape to a different land? Head to Sugarland! Don't miss today's review of Martha Conway's historical mystery Sugarland. Ready to snuggle up with a great book and a cup of cocoa? Read today's review of Martha Conway’s Sugarland. Looking for a book to add to your TBR pile? Read today's review of Sugarland. Enter to win a copy of Sugarland! Just fill out the Rafflecopter form below. We will announce the winner in the Rafflecopter widget Monday, October 17. Jodi--Thanks for this interview. Martha--Congratulations on the success of your first two novels. From the sounds of it, Sugarland will also snag an award or two. I enjoyed learning how this novel ebbed and flowed, as well as hearing how a dropped storyline resulted in 1) a stronger novel and 2) an additional novel. Good luck with this third novel. It sounds like it's an enjoyable read. Thanks so much for this interview! I am very excited and looking forward to reading this novel. I love historical fiction and mystery. Sounds like it could be adapted for the big screen! Good luck on your tour! It was so interesting to read about the process in writing Sugarland,. Thank you! I had a lot of fun (read: hard work plus moments of joy), probably like every other writer, working on this novel. I think the dropped story line made the plot tighter. But to me, that backstory will always be there! OK, I will double up. What kind of money do you make writing? I will need to see your tax returns.